The tea leaves don’t bode well for Bitcoin. Traders who look for future price direction in chart patterns are finding more indicators suggesting the world’s largest digital currency may have further to fall. 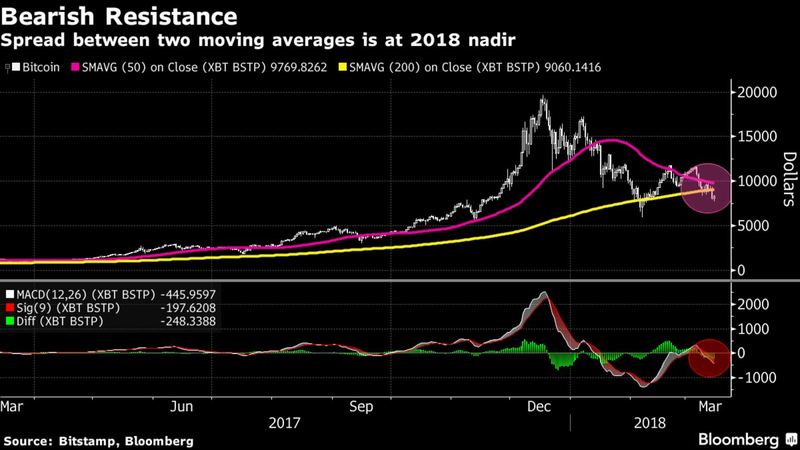 Bitcoin’s 50-day moving average has dropped to the closest proximity to its 200-day moving average in nine months. Crossing below that level — something it hasn’t done since 2015 — signals fresh weakness to come for technical traders who would dub such a move a “death cross.” Another moving-average indicator of momentum has already turned bearish. While many cryptocurrency investors don’t follow technical analysis, the digital-coin universe is drawing interest from professional traders who pay growing attention to the indicators, after the token vaulted to a record in December. “There’s been a definitive shift over the past couple of months after the bubble activity at the end of 2017,” said Paul Day, a technical analyst and head of futures and options at Market Securities Dubai Ltd. The strategist studied the virtual currency’s 2013 tumble for clues on how it may act this time round. His conclusion? Gear up for a 76 percent tumble from late February highs, which would take Bitcoin to a paltry $2,800, if the downtrend is repeated. Bitcoin fell 2.2 percent to $8,120 at 11:17 a.m. in London, according to Bitstamp prices. Regardless, Bitcoin investors had better make peace with volatility, which is often tied to regulatory and security risks. When the currency’s 50-day moving average last hovered below the longer measure, during the first 10 months 2015, its performance was lackluster. It fell 5.2 percent in that period, and then rallied 43 percent through year-end from the day it broke back above the resistance level. It has remained above that line ever since 2015 and racked up three successive annual gains in the process. “There is an element of charting and technical analysis being used in Bitcoin and cryptocurrencies trading, considering the professional bodies now entering the market,” said Daire Ferguson at Irish currency platform AvaTrade Ltd, adding that regulatory policies would bind the fortunes of digital tokens.